Located in Kensington, Maryland, here at Kuzma Construction we specialize in all aspects of home remodeling and renovation. From additions and kitchen and bathroom remodels, to bump-outs and the addition of beautiful and functional square footage to your home. As a Kensington, MD remodeling company, we understand your neighborhood, what will add maximum value to your home, and most importantly, how to work with you step-by-step in planning the perfect remodel to enhance the flow of your daily life. Our clients range from new Kensington homebuyers looking to upgrade and enhance their purchase to perfectly fit the needs of their family, to longtime residents looking to age in place or modernize aspects of a home they have loved for years, but have simply outgrown. 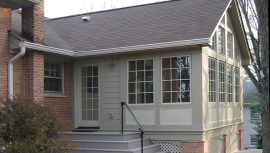 Considering an addition or remodeling upgrade for your home? Give us a call today to chat further. We’re happy to offer a free consultation and estimate for your project.